The Central Andes in South America are a first-order geological structure on our planet of an active continental margin. 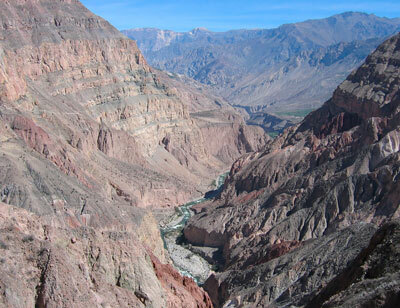 The combination of the subduction-related magmatism and processes and the timing of uplift and volcanism shaped the Andean Cordillera. This region provides unique examples of the generation of andesite magma during passage through thickened crust. As one of the largest ignimbrite provinces, the Central Andes also show ignimbrite “flare-ups” that are linked to crustal thickening and increased mantle magma input. Ignimbrites and andesites are the “smoking gun” of crustal differentiation at active continental margins. The interplay between tectonics and magmatism produced the world’s largest porphyry copper deposits. 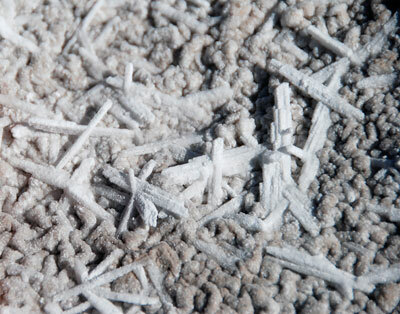 The extremely arid climate conditions of the Atacama Desert led to spectacular salt deposits including the world’s richest deposits of lithium, boron, iodine and nitrates. Significant deposits of metal-rich minerals are known to exist on the deep-ocean floor, in some instances exceeding global land-based resources. In recent years, advances in understanding and technology coupled with an evolving regulatory regime have resulted in growing interest in mining these deposits. However, assessing the potential and challenges of exploitation is hindered by our relatively poor knowledge of this vast and inaccessible environment. This issue will introduce the reader to the deep-ocean mineral deposits that are attracting most interest, describing genetic models for their formation and future research challenges, including the possible role of microbes in concentrating metals. It will examine the potential for the low-carbon extraction of metals from these novel deposits, and provide readers with a better understanding of the host of environmental, social, economic, political and legal challenges that need to be addressed for the sustainable development of these resources. Mining Deep-Ocean Mineral Deposits and Ecology: What is at Risk? Changes in topography on Earth, particularly the growth of major mountain belts like the Central Andes, have a fundamental impact on regional and global atmospheric circulation patterns. These patterns, in turn, affect processes such as precipitation, erosion, and sedimentation. Over the last two decades, various geochemical, geomorphologic, and geologic approaches have helped identify when, where, and how quickly topography has risen in the past. The current spatio-temporal picture of Central Andean growth is now providing insight into which deep-Earth processes have left their imprint on the shape of the Earth’s surface. 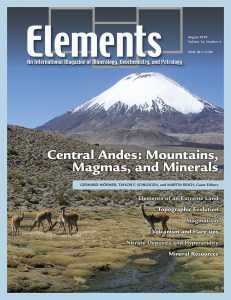 The Neogene history of the Central Andes records one of Earth’s most productive periods of high-flux silicic magmatism. Subduction of an aseismic ridge, the Juan Fernández Ridge (JFR), led to changes in mantle melt productivity that initiated a transcrustal magmatic system culminating in massive caldera- and ignimbrite-forming eruptions. This volcanism is time transgressive, tracking the southward passage of the JFR beneath the Central Andes. The volcanic field is underlain by a composite, arc-long mid- and upper-crustal granodiorite batholith that represents extensive processing of the continental crust by mantle-derived magmas. This batholith stabilized the upper crust and contributed to the extreme elevations despite a net crustal loss beneath the Puna region. 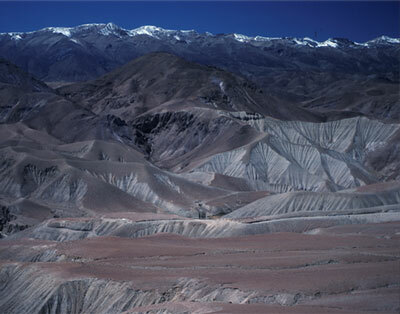 The nitrate deposits of the Atacama Desert are unique when one considers that in most surface environments nitrate is produced or consumed by biological processes and is easily washed away by rain. Nitrate deposits have puzzled geologists since Charles Darwin’s visit to the Atacama in 1835 and several hypotheses have been proposed to explain their origin. 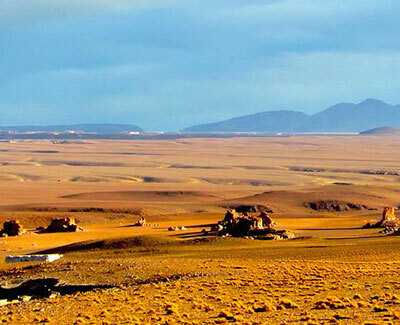 Here, we review our current understanding of the nitrate deposits in the Atacama Desert and show that nitrate’s primary origin is predominantly atmospheric. 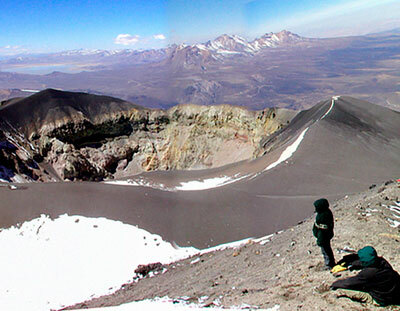 However, its massive accumulation and preservation specifically in Atacama is due to the serendipitous convergence of climatic, tectonic and hydrologic conditions that are unique to the Central Andes. 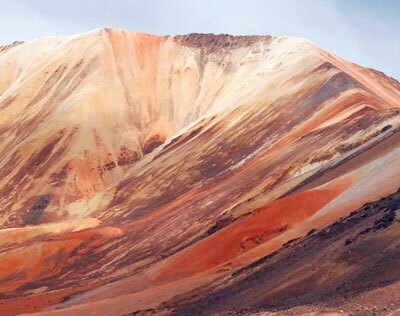 The Central Andes has one of the richest base metal endowments on Earth. In 2017, the Central Andes accounted for the mine production of around 39% of the world’s copper, 23% of its silver, 20% of its molybdenum, 14% of its zinc, and 12% of its tin as well as significant shares of other metals including gold and lead (USGS 2018). These metals are found in a variety of ore deposits of which by far the most important are those that occur as part of the “porphyry system” in the sense of Sillitoe (2010). However, important ore deposits of other mineralization styles also occur in the Central Andes. This info box presents characteristics of main and/or representative Mesozoic ore deposits that occur between latitudes 11°S and 30°S.